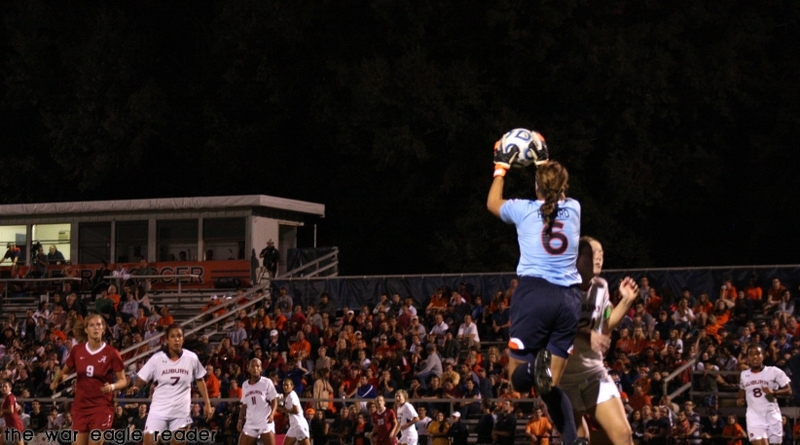 In collegiate soccer’s golden goal, sudden-death overtime, a match doesn’t end until the clock hits triple-zeroes, or until somebody finds the back of the net. 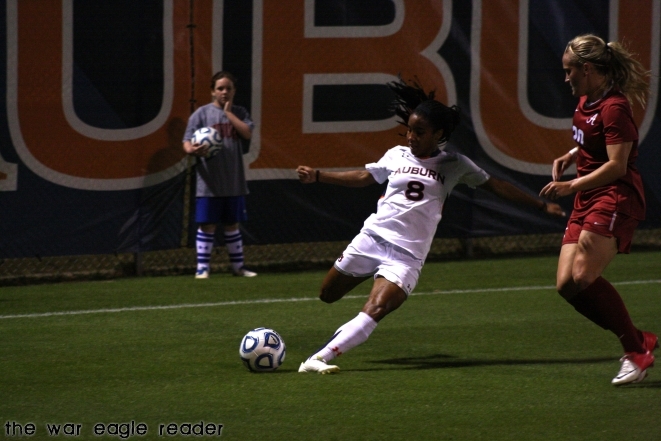 Auburn forward Tatiana Coleman had to remind herself of that toward the end of Thursday night’s classic, double-overtime match against arch-rival Alabama. 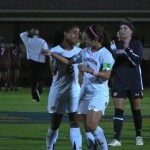 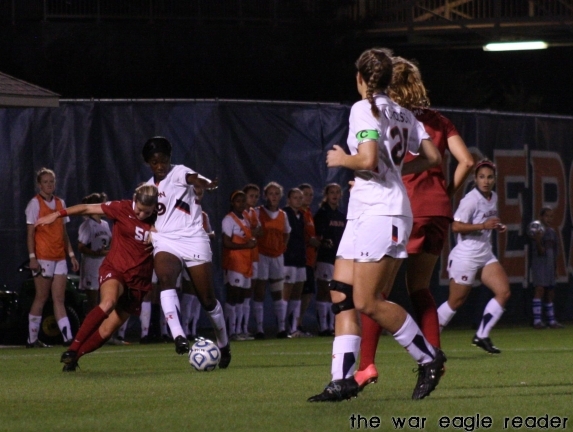 Coleman found herself a solid look at a game-winning goal as the final seconds of the first overtime period ticked off the clock — but her shot banged off of the near post, and as the period expired, everything that the Tigers had worked for all season seemed lost. 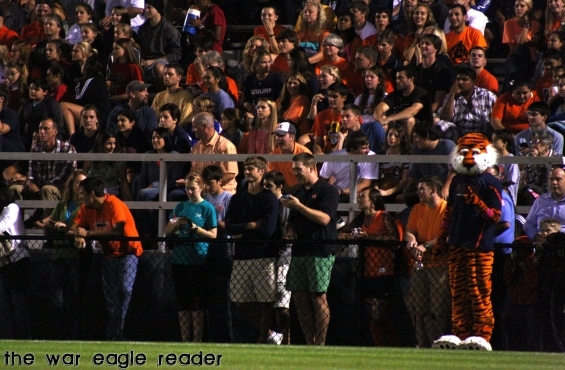 The victory Auburn so desperately needed was quickly slipping into a tie. 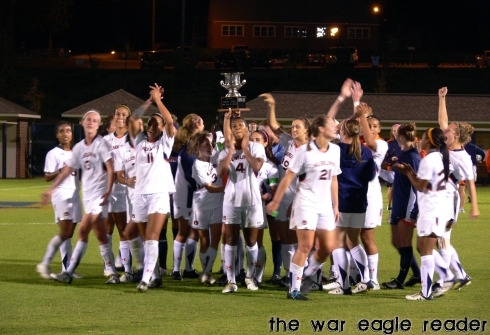 With a tie, the Tigers would have been without a bye in the first round of the SEC tournament, the senior class would have ended their careers at Auburn with a sour Senior Night, and that trophy — “that dang trophy” — would be staying in Tuscaloosa for another year. 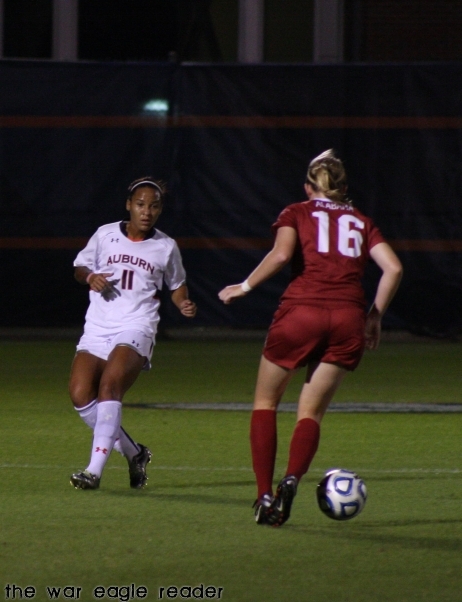 Fortunately for Coleman and the Tigers, there was still one more overtime period left to play in the biggest match of year. 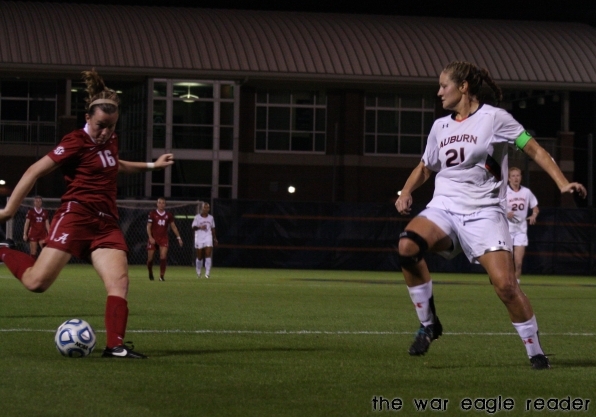 Coleman didn’t stop playing, even after the Tide had come back from an early 3-0 deficit to tie the game, and even when there was less than a minute left to play in the match’s second and final overtime period. 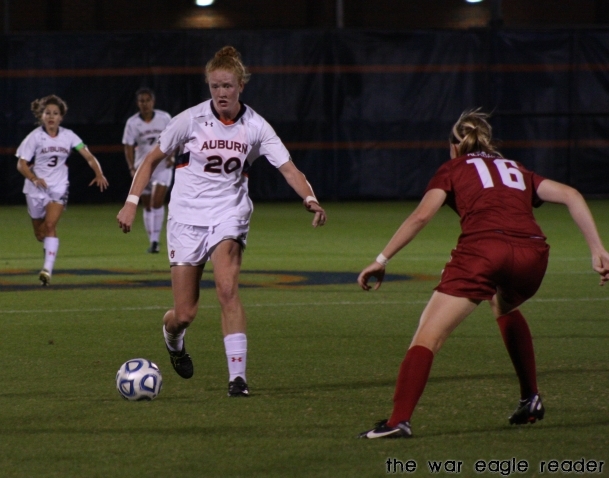 That’s when Auburn goalkeeper Amy Howard turned defense into offense, and booted a save clear over the midfield line and into Bama territory, where Coleman tracked it down off two bounces, and touched it over the Alabama keeper’s head and — an eternity later — into the back of the net. 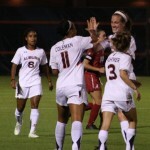 Clutch Coleman: Tatiana Coleman has eight career game-winners. 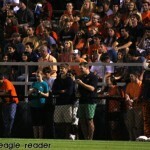 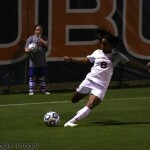 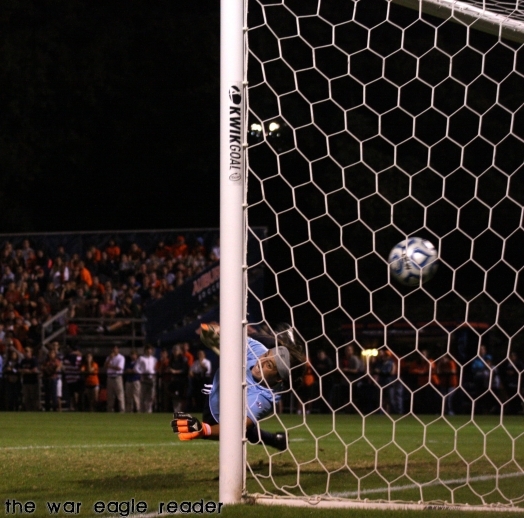 Auburn won, 4-3, on Coleman’s kick 109:28 into the match — with just 32 seconds left on the clock. 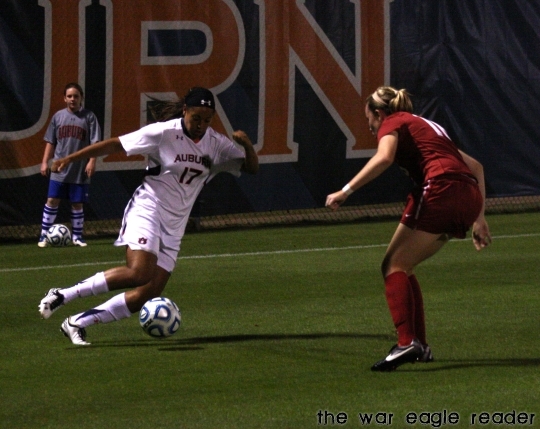 Howard earned an assist on the score, from all the way back at the goalkeeper position. The game-winner was Coleman’s second score of the night, after a goal in the 32nd minute gave the Tigers their early 3-0 lead. 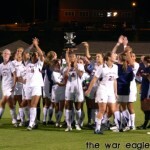 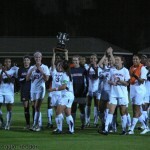 Last year, of course, the Tigers brought home the SEC tournament championship. 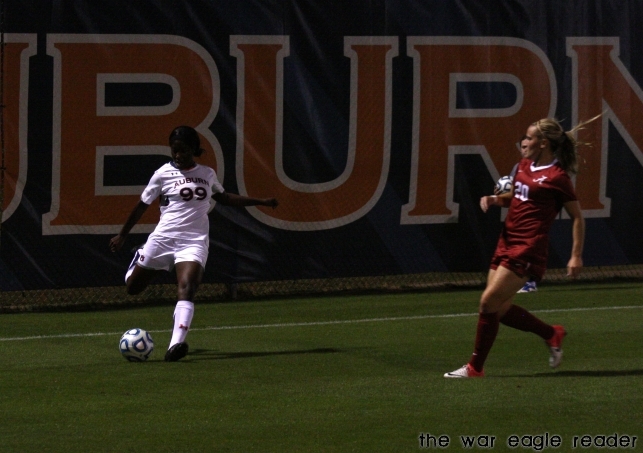 With Thursday’s win, Auburn claimed the sixth seed in Orange Beach, giving the Tigers a bye into the second round and a matchup against third-seeded Tennessee on Wednesday. 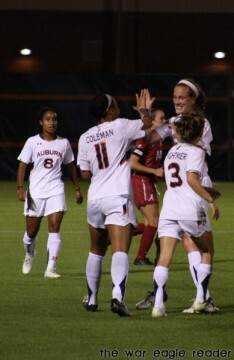 The Tigers will shoot for more high fives this week as they defend their SEC tournament championship. 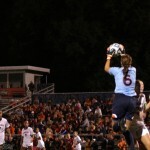 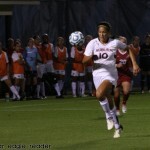 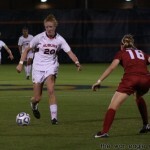 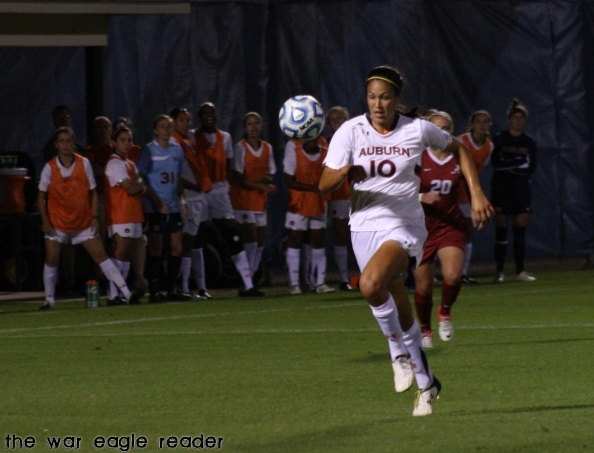 Auburn jumped out to 3-0 lead early, starting with a 9th-minute, unassisted goal by senior forward Mary Coffed. 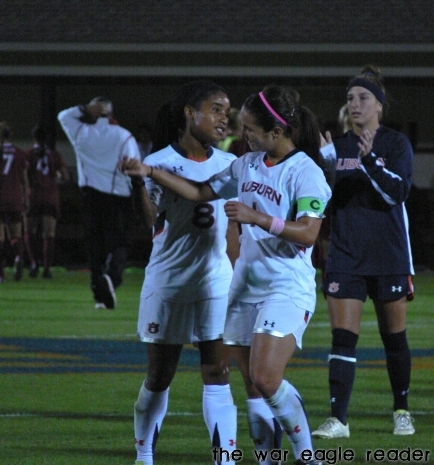 Coffed scored again in the 27th minute off of an assist in the box from Coleman, and the Tigers were off to strong start. 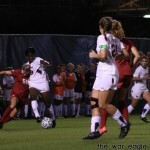 In the end, that 3-0 lead proved to be too much for the Tide to overcome. 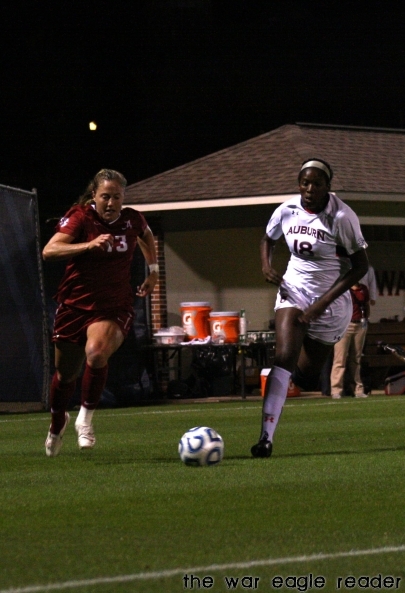 Alabama fought back in the second half with three unanswered goals to force overtime. 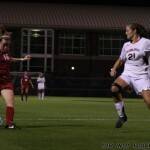 Theresa Diederich scored off of a corner kick for the Tide in the 55th minute, Merel Van Dongen converted on a penalty kick in the 69th minute, and Laura Lee Smith tied the game in the 79th minute. 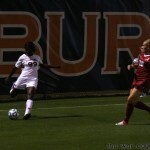 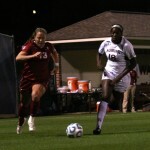 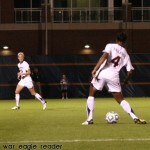 Still, Howard held Alabama scoreless through overtime and finished 8 saves on the night. 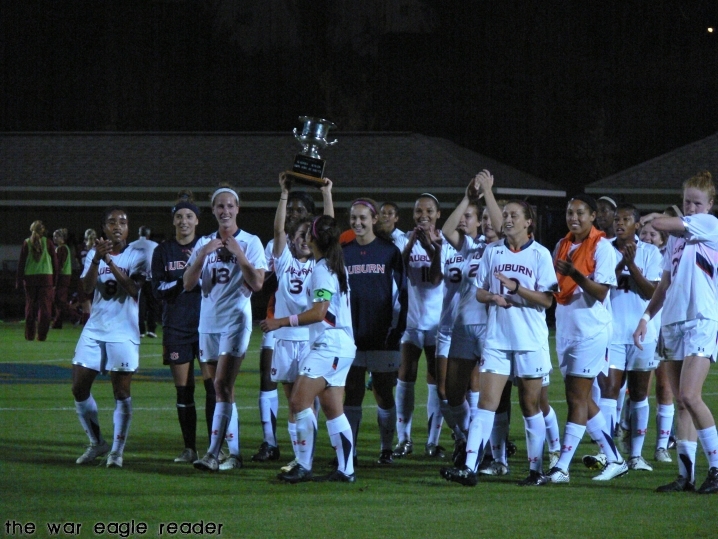 The Tigers will now travel to Orange Beach to defend their SEC tournament championship from a year ago. 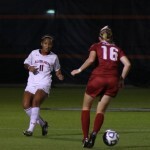 The tournament begins today with a pair of matchups featuring the 7th-10th seeds. 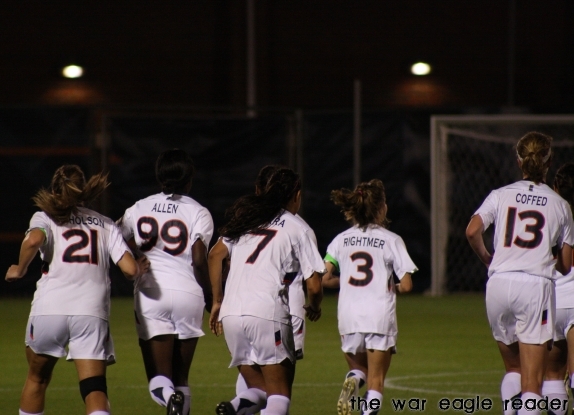 As the sixth seed, Auburn will wait to play until Wednesday in the tournament’s second round. 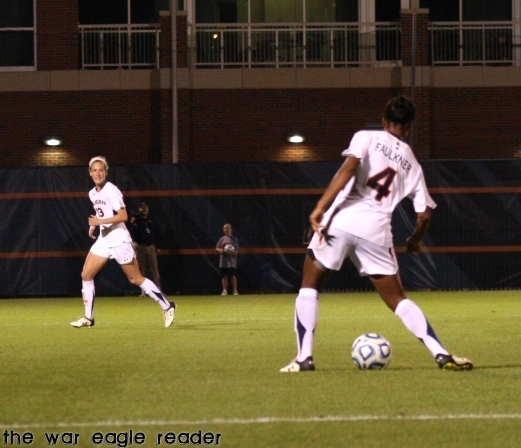 Kickoff between the Tigers and third-seeded Volunteers is at 2:30 p.m. on Wednesday. 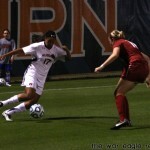 “The bye is massive,” Hoppa said. 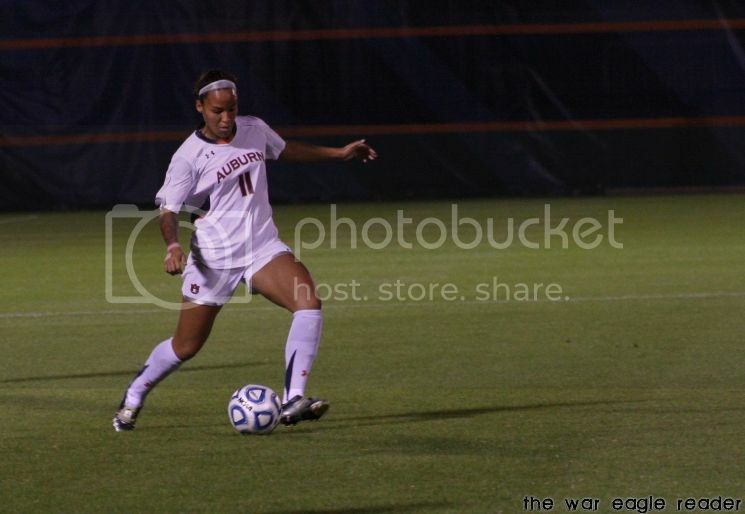 “You can’t win the tournament, I don’t think, by playing on Monday. 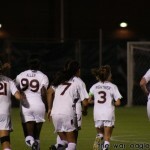 TWER photos by Amy Thorington and Abby King.